Amid a difficult run with injuries has emerged one of season 2018’s finest stories. 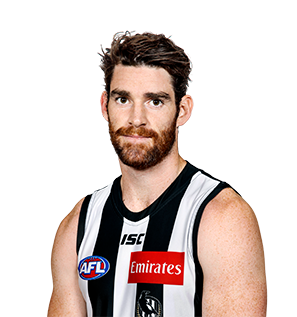 Collingwood premiership player Tyson Goldsack will require a left knee reconstruction after suffering a tear of his anterior cruciate ligament in last Saturday’s JLT match against the Western Bulldogs in Moe. 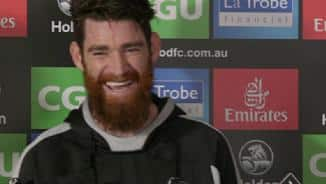 Goldsack has filled a variety of roles in his 11 years at Collingwood, but has more recently returned to his familiar place as a reliable member of the Magpies defence. Goldsack has spent plenty of time as a rangy half back where, although predominantly a shut-down player, he has the ability to create when the situation allows. Injuries and the occasional illness have been a bugbear over the journey and after playing four games in 2016, Goldsack bounced back with what was arguably a career-best season in 2017. He marshalled the young Collingwood defence, often playing above his height as the coaching staff turned to a smaller, nimbler set up. His courage was lauded by his teammates, and he was a deserved winner of the Darren Millane Perpetual Memorial Trophy as Best Clubman. Given he played only four games the previous year, you wouldn’t have been forgiven for thinking 2017 may have been Goldsack’s final season. Instead, the 30-year-old turned the thoughts of any naysayers on their heads, playing 20 of a possible 22 games, recarving his niche on the half back flank. As the Magpies made the change towards a smaller backline, Goldsack came into his own, playing tall, playing small, and providing his younger teammates with the ideal role model for courage and selflessness. If Goldsack’s year could boil down to a single incident, it would be his refusal to leave the field despite a broken shoulder against Fremantle in round 11. He instead chose to play on, battling manfully in the air and on the ground despite severe pain to help secure Collingwood’s third win in as many weeks. He was a deserved winner of the Darren Millane Perpetual Memorial Trophy as Best Clubman and was nominated Collingwood’s Most Courageous Player in the AFL Players’ Association MVP Awards. The club recognised his fine form and significant contribution to its culture with a one-year contract extension at season’s end. 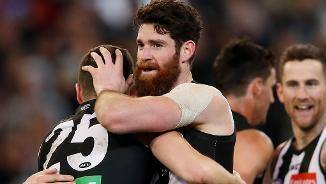 Injury meant Tyson Goldsack was behind the eight-ball even before the 2016 season began. 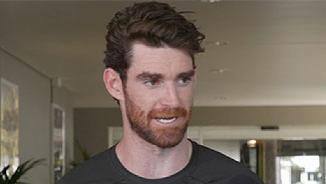 As the Collingwood list were put through their paces at the club’s pre-season training camp in Queensland, the versatile swingman was left to rehab an injured knee. It meant Goldsack wasn’t sighted at AFL level until round three, when he collected nine disposals and laid three tackles against St Kilda at the MCG. Illness kept Goldsack out of the team the following week, and time in the VFL followed as the Magpies approached mid-season. However byes and issues with injury and form kept the 29-year-old from playing consecutive games at either level. His AFL games came in rounds 15, 21 and 23, while in the VFL his eight appearances were also spread throughout the season. An injury-free pre-season should allow Goldsack a clearer run on the park in 2017. Goldsack entered the ninth season of his career at Collingwood in a familiar position as a member of the club’s leadership group. On the field, it was a place on the half-forward line where the 28-year-old was named as Collingwood travelled to Brisbane to take on the Lions in round one. While paper teams in the early stages of the season suggested that Goldsack was spending the majority of his time in the forward line, he was often seen in the comfortable surrounds of defence. In round eight, Goldsack was everywhere as he joined teammates in a fitting celebration of Scott Pendlebury’s 200th game against the Gold Coast. 24 disposals was the second highest tally of his career, while the impressive game also included six marks and nine contested possessions. Unfortunately, Collingwood fans wouldn’t see such feats replicated throughout the remainder of the year. Knee tendonitis hampered Goldsack through the middle of the year and he was eventually withdrawn from Collingwood’s team as the Magpies gave him time to recover from the persistent injury. He returned for round 17’s clash with the Western Bulldogs, before returning to the VFL and subsequently being sent for season-ending surgery. “He has been struggling with that knee tendonitis for some weeks,” Director of Football Neil Balme told Collingwood Media’s Blackmore’s Injury Update in late August. With fitness on his side, Goldsack will no doubt have a point to prove in 2016. It took eight years, but the AFL world finally caught onto Tyson Goldsack in 2014. In this age of forward pressure, Goldsack’s tenacity, repeat efforts and willingness to sacrifice himself for the good of his team made him one of Collingwood’s most valuable players in season 2014. “He can kick his one or two goals and set up a couple each week, but to be putting real pressure on the opposition and be the start of our team defensive at the front line is something Tyson really prides himself on,” coach Nathan Buckley told the ABC following Collingwood’s win over Essendon on ANZAC Day. Goldsack’s ability to influence games without having the ball in his hands made him a genuine weapon in the Magpies’ attacking fifty, particularly in the first half of the season. His work off the ball – tackling, chasing and corralling – made the competition stand up and take notice. He averaged a career-high 4.3 tackles across his 20 games and kicked 10 goals from 15 scoring shots, while his 58 one per centers was his greatest return since 2009. Goldsack’s year began to gain traction when he kicked two goals in the win over Sydney in round two and by ANZAC Day he had worked his way into career-best form. Against Essendon, he was ferocious, laying 10 tackles and kicking a crucial goal during his side’s second quarter charge. Although he only returned 11 disposals for the game, he was arguably one of Collingwood’s most important players in its 23-point win. Goldsack kicked only five more goals for the year, as injuries began to take their toll, forcing the coaching staff to employ him as a swingman at either end of the ground. He missed a fortnight mid-season due to injury but played out the remainder of the year, and was one player lauded for his leadership during a time when several senior players succumbed to injury. A free agent at season’s end, Goldsack showed his commitment to the Black and White, signing on for another three years. It was a frustrating 12 months for Goldsack who was rarely able to gain the momentum that helped make him one of the most important cogs in the Collingwood machine in 2012. He made a delayed start to the pre-season after undergoing surgery on the ankle he injured in round 19 last season but still managed to make it on deck by the time round one rolled around. The versatile utility started his campaign with two goals in attack against North Melbourne and made an impact as a substitute on ANZAC Day when he kicked two second half goals. Unfortunately he was sentenced to a nine-week layoff when he injured his hip against St Kilda in round six. He was seemingly forever 1-2 weeks away from resuming but the Magpies took no chances. It took only one rusty performance in the VFL against Box Hill before he was flung back into the heat of the battle at senior level. He marked his return with a long goal on the burst in the loss to the Suns but from there on was sent to half back where his intensity and will-to-win made him a difficult proposition for all opposition forwards. Laid seven tackles in the Elimination Final defeat and will be hoping to enjoy a clearer run in 2014. The premiership defender was reborn as a forward and thrived in the role that saw him rewarded with a two-year contract extension. Had the most number of senior opportunities he has had in six seasons to play 22 games, missing three with an ankle injury late in the year which later required surgery. Kicked 24 goals and gave the Pies plenty of defensive pressure with 69 tackles, including eight against West Coast in the Semi-Final. Was again struck by misfortune in the pre-season, diagnosed with Glandular Fever and losing 9kgs. Returned to play in the NAB Cup premiership against Essendon, but had to wait until round eight to play a home and away match. He played 12 of the remaining 18 games, but was again the fall guy for the finals. Put the clamps on Andrew Embley in the qualifying final against West Coast, but was omitted for the preliminary final, and again an emergency for the Grand Final. Is subsequently the only premiership player on the list to never have played in a losing (or drawn) Grand Final. Failed to play a game until round 13 after an interrupted pre-season marred by injury and illness. Missed only three matches after his reinclusion. Unfortunately they included the qualifying final and the drawn Grand Final through omission. Was the fairytale story of the 2010 premiership, replacing Leon Davis in the replay. Coming off the interchange, Goldsack kicked the first goal of the Grand Final replay (his first since round 15, 2009) and had eight more possessions in the victory. Represented Australia in the International Rules series in Ireland in October. Endured a patchy season where he strung more than two games in succession only once. Was an emergency on five occasions. Broke back into the side for the semi final and preliminary final and played an important role down back in the five-point classic against Adelaide. Didn’t suffer from the second year blues, but he still wasn’t quite at the level he reached in 2007. Missed five matches mid-season before returning to the side in round 14 and only missed one match thereafter. Managed the first four goals of his career, breaking his duck on Anzac Day against Essendon. Impressed in the early rounds for Williamstown in the VFL and was promptly promoted to the senior side for the round eight match against the Western Bulldogs. Goldsack didn’t miss a game for the rest of the season, matching up against Shaun Higgins on debut, and blanketing Michael O’Loughlin in all three games against the Swans. His tackling and desperation stood out, and his finals performances, against Sydney and West Coast in particular, were outstanding. Received an AFL Rising Star nomination in round 21 after a career high 25 disposals against the Swans. Played in the TAC Cup for Gippsland Power as an overage player (19-years-old). Kicked five goals in Gippsland’s win over the Eastern Rangers. Played alongside fellow soon-to-be-Magpies Brent Macaffer and Tristan Francis. Drafted to Collingwood with pick 63 in the AFL National Draft. Managed 10 games in his first season for the Gippsland U18s as a top-age player. Trained with Hawthorn over the pre-season but was not drafted.